FILE - Representations of the Ripple, Bitcoin, Etherum and Litecoin virtual currencies, Feb. 13, 2018. 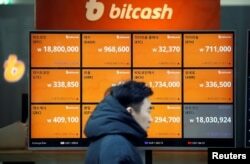 FILE - A man walks past an electric board showing exchange rates of various cryptocurrencies, including Bitcoin, at a cryptocurrencies exchange in Seoul, South Korea, Dec. 13, 2017. FILE - A logo of Bitcoin is seen on an advertisement of an electronic shop in Tokyo, Japan, Sept. 5, 2017. 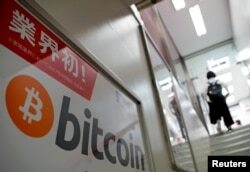 ​Japan is widely seen as Asia's most liberal place for cryptocurrency. That country, which has let 17 exchanges fully register, overtook China in 2017 as the biggest Bitcoin market in the world with 58 percent of the global volume. Japan declared Bitcoin legal tender in 2017.